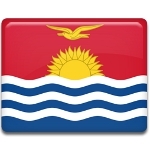 July is the month of holidays in Kiribati. All national holidays are appointed to be near July 12, which is Independence Day, and one of them is National Culture Day. The first European settles arrived in Kiribati in the 17th and 18th centuries. They brought Christianity and other religions, and their own traditions. Although this influenced on the culture of Kiribati, it's still unique. Many of traditional feasts, rites and beliefs live in the present-day Kiribati. Traditional music and dancing play an important role in everyday life of the islanders. The musicians compose songs about love and religion, patriotism and rivalry, as well as about everything, that surrounds the islanders. Songs are always accompanied by vigorous dances, drums and guitar play. These are two main musical instruments on the archipelago. Various festive events are organized to celebrate National Culture Day in Kiribati. Canoe racing and traditional dance competition are the most common events, that are organized on every island of the state.